Hardback, 1st edition. SIGNED. In two parts : Part I 1888-1972 which features views expressed and material published, including the memoirs of officials and police officers etc. Part II 1973-1975 includes attempts to consolidate the case against Druitt and demolish that against the Duke of Clarence. With Bibliog. and Index. 174pp. 12mo. h/back. Includes Errata slip. 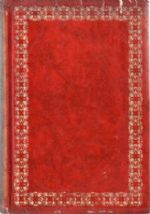 Covers red faux leather/gilt block pattern dw. not required. V. lightly foxed edges and eps, sunned sp. with mks. left by film wrap to covers plus tiny white mks. along edges where film wrap has been removed. 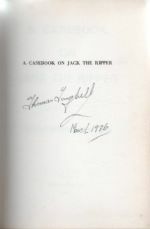 The book was exposed to sunlight hence the markings. 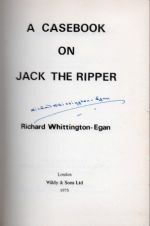 SIGNED NOT ONLY BY RICHARD WHITTINGTON-EGAN, but also by THOMAS TOUGHILL author of 'The Ripper Code' pub. in 2008 by Sutton. Vg. Scarce and much sought after, particularly signed.